"My Favorite Husband: Georges Christmas Presents"
If Christmas is, indeed, the happiest time of the year, it is because at its core Christmas is about family. That notion is easy to lose in the mayhem of parties, feasts, shopping, gift giving and receiving, not to mention Football Bowl season. Christmas is about family, and the foundation of the family unit is the love between a married couple. A strictly Religious interpretation of the Nativity Story focuses on the majesty and miracle of the Savior's Divine Birth, but an even deeper, perhaps more significant miracle is that it is the story of the love between a husband and wife and their unquestioning support for one another as they bring a son into the world during difficult times. The most popular Christmas stories tend to be for and about children, for good reason. However, the Christmas tale which is the best example of love and sacrifice at Christmas is O. Henry's short story, "The Gift of the Magi". First published in The New York Sunday World on December 10, 1905. Set in the grimy yet hopeful world of Gaslight era New York City. The story is infused with the Victorian ideal that through hard work and sacrifice people could and would rise above their station or class, but as our story opens, newlyweds Della and Jim have "nothing but love" to live on. That is not completely true, Jim possesses a fine pocket watch, perhaps an inheritance from a doting grandfather, while Della's most striking feature is her long and luxurious hair. Each is desperate to find a Christmas present for the other which will demonstrate the depth of their love. While Jim is out on a snowy Christmas night, Della sneaks off to the local wig maker who cuts off her hair for $20. With the proceeds she buys an elaborate chain which will be appropriate for Jim's fine watch, and waits anxiously in their apartment for Jim, knowing he will be shocked to see her with short hair but excited to give him the watch chain. He finally returns bearing a collection of ornamental combs for her hair, which he has paid for by selling his watch. Some of the couples in this collection were married and had children in real life, although the kids were not part of their radio programs, Lucille Ball and Richard Denning of My Favorite Husband being a notable exception. The couple in MFH was so popular with audiences that CBS was desperate to bring them to Television. Star Lucille Ball was enthusiastic about the project but insisted on working with her real-life husband, Desi Arnaz. The marriage was already a rocky one, and CBS hesitated to invest in a project which smacked of 'couples therapy'. 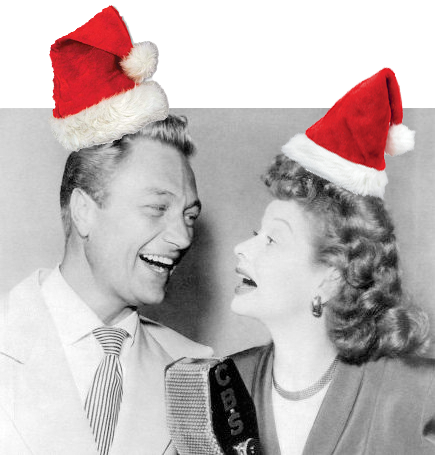 Lucy and Desi assumed most of the risk by forming Desilu Studios and producing I Love Lucy themselves. Between Lucy's ability to charm an audience and Desi's accidentally excellent management (he was not experienced enough in the business to economize, so he paid for the best of everything) the program was one of the biggest hits in TV history. CBS hedged its bets by producing My Favorite Husband for the small screen. The first two and a half seasons were broadcast from CBS Television City, but the 1955 season was shot on film at Desilu Studios. My Favorite Husband, starring Lucille Ball and Richard Denning as Liz and George Cooper, "two people who live together and like it." December 16, 1949. "George's Present". Liz is desperate to figure out what George is going to get her for Christmas and George is giving no hints. She wants to knit him a sweater but finds out that her mother-in-law has already had her needles clicking. December 23, 1949. "The Sleigh Ride". 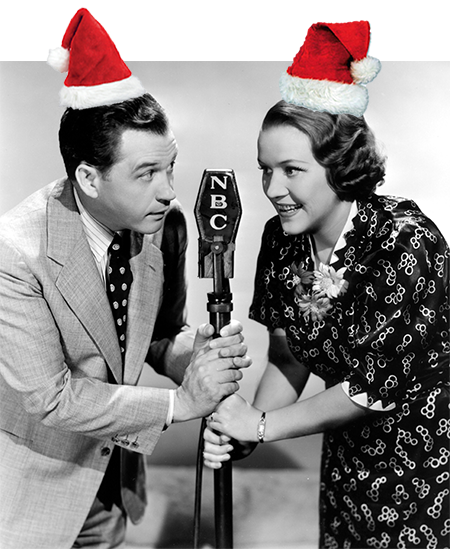 Despite George's lack of competence trimming the tree, Liz decides that getting a sleigh and going caroling is just the thing for Holiday Cheer. The only problem will be finding a sleigh, but she manages, even if she needs to have the mailman use his motorcycle to pull it home. Blondie, starring Penny Singleton and Arthur Lake in a program based on Chic Young's comic strip. December 25, 1939, "A Christmas Carol", during a well-deserved Christmas nap, Dagwood dreams he is Dag Cratchit, working for Scrooge McDithers. December 15, 1948, "Christmas Show". Dagwood wants to find out what the kids want from Santa Claus but is not having a good deal of success. 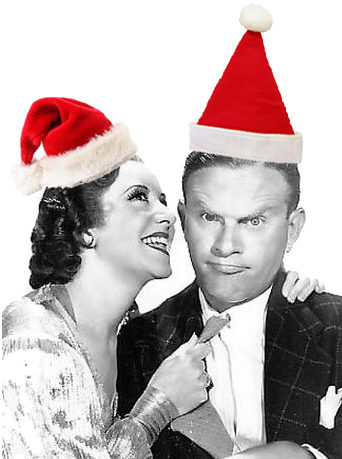 Burns and Allen, Starring George Burns and Gracie Allen. One of the best true-love stories in all of show business, George and Gracie worked together as an act before they were a couple. It wasn't long before George fell in love with his new partner, but she was waiting for another guy. Finally, George stormed out of a party, leaving Gracie in tears. It was then that she realized that if George could make her cry, she must be in love too. December 23, 1940, "Christmas Show". George is determined to put on the Christmas play, but Gracie has lost the scripts. She was doing her Christmas shopping, so maybe she lost them at the post office. Two days before Christmas at the post office, what trouble could there be? December 23, 1941, "Santa's Workshop". After George goes to bed, Gracie travels to the North Pole with Herman, the family duck. December 22, 1942. "Santa and the Pirates" Gracie, George, and Herman the Duck fly to the North Pole to discover that an evil pirate has stolen all the presents for the kids, so Gracie volunteers George to fight the Pirate. December 19, 1944, "Christmas Presents", To buy presents or not to buy presents? Gracie remembers that there are just a few more hinting days before Christmas. Everyone thinks George looks like Clark Gable when its Christmas Shopping season. 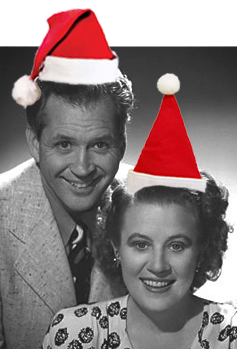 Fibber McGee and Molly, Jim and Marian Jordan began sharing Christmases together even before the Great War. After having some success together in vaudeville, they stopped in Chicago to visit Jim's brother where they heard a very unfunny show on the radio. A challenge went out (along with a ten-dollar bet) that they could not do better, and after a visit to the station, they had a new job! Fibber and Molly were on the air for more than 1600 episodes. December 24, 1940, The Bon Ton Department store delivers an impressive package to McGee's door on Christmas Eve, but it has next door neighbor Gildersleeve's name on it. Even so, they open it to discover an impressive radio-phonograph combination console which develops a serious dislike for Fibber. 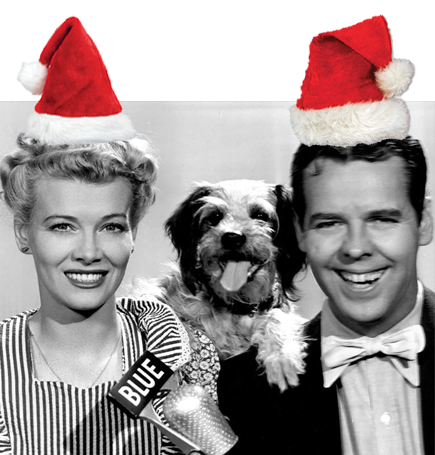 When the automatic record changer self-destructs, our heroic couple is forced to desperate measures, and what could be more desperate than to face the Christmas Eve Crowd at the Bon Ton! December 16, 1941. Not a man to be taken in by an itinerant tree salesman, Lumberjack McGee and his mighty hatchet take to the woods to collect a Christmas tree. After losing the hatchet, his wristwatch, and having a tire blow out, the tree which would have cost ninety-eight cents downtown is now valued at twenty-nine bucks. December 22, 1942. The master of 79 Wistful Vista has a bad case of the "Christmas-is-a-racket" blues until Teenie from across the street turns up to sing "The Night Before Christmas" with the Kingsmen. This number would become an annual tradition for the rest of the show's run. December 19, 1944. There's Christmas Presents to be found, and Fibber is desperate enough to search the infamous hall closet, never mind that Molly thinks he should apply for a hinting license. Be the first to comment on "Christmas Couples"